Alfred, the application launcher for the Mac, received a fairly substantial update today which brings important new functionalities such as extension support, Growl integration for action outputs, a new theme inspired by OS X Lion, and several bug fixes. Personally, I've been a big fan of Alfred since its first release last year, and I've followed the development closely as I switched from Quicksilver (which came back from a long hiatus a few months ago) and started looking into the customizable search and launch environment offered by Alfred. In the past months, in fact, Alfred evolved into a minimal, yet powerful application launcher capable of doing a bunch of other things such as filesystem navigation, clipboard management, AppleScript launching and dictionary. I was particularly impressed with the 0.9 version, which allowed users to assign a keyboard shortcut to any AppleScript on your machine, similarly to how the popular FastScripts lets you pair a shortcut with a script. Whilst the developers are still planning a major 1.0 release that will likely see the Powerpack (a set of premium additional features) become available as in-app purchase on Lion's Mac App Store, Alfred 0.9.9 has been publicly released today and, in spite of what the version number suggests, it is a milestone release that sets the path for future Alfred versions and the kind of integration with the system the developers are willing to bake into their application launcher . 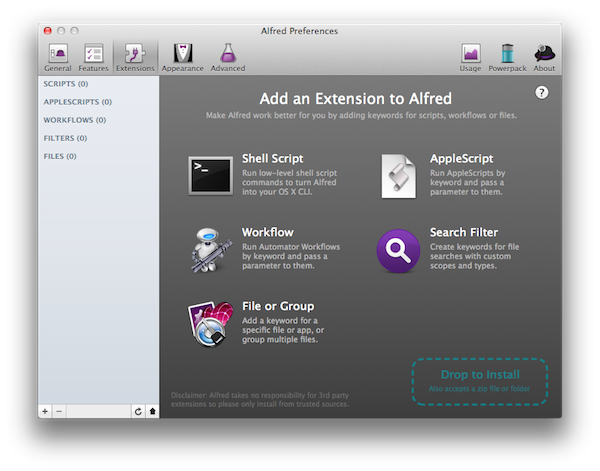 Alfred can now be extended thanks to built-in support for shell scripts, Automator workflows, AppleScripts, file groups and Search Filters, whereas previous versions of Alfred could only assign a shortcut to scripts saved elsewhere on your computer, or run Terminal commands in the background. With the new Alfred Extensions -- available in the Preferences -- users can extend the app by natively integrating scripts, workflows, and more into Alfred. This means that, for instance, a Terminal command can be configured and saved directly into Alfred, assigned a keyword and run from Alfred's search UI without leaving the app or seeing the Terminal launch in the background. The same applies to AppleScripts and workflows -- once a parameter (example: how to parse a task for OmniFocus or a set of images) has been set, Alfred will take the inline AppleScript, and execute it. Expect a dozen of tutorials on how to integrate Alfred through AppleScript with your favorite Mac apps to surface online in the next few days. Indeed, support for extensions (which you can also download and install via drag & drop) make for a great opportunity for the devs to build an active community around Alfred. We can't wait to start downloading and recommending the best tweaks and extensions around. I'm not exceptionally skilled with the Terminal or AppleScript, but in a few minutes I managed to create extensions that disable window animations in Lion, restart the Finder, and enable window animations again -- three commands, three keywords in Alfred. I'm looking forward to OmniFocus or Evernote users coming up with ways to integrate those apps' AppleScript dictionaries into Alfred (Alfred's own developer seems to be getting along quite well with Alfred and Things' syntax). Perhaps even more impressive are live search filters and the "file or group" feature. With search filters, Alfred lets you build a filter for one or multiple file types and apply that filter as you search for a specific document. To test this, I built a filter for PDFs in my Dropbox folder (Alfred allows you to define a "scope" for your searches) and assigned it a keyword. On my computer, I named a PDF and a folder with the same name; when I typed that name in Alfred with no search filter, the app found both the PDF and the folder. 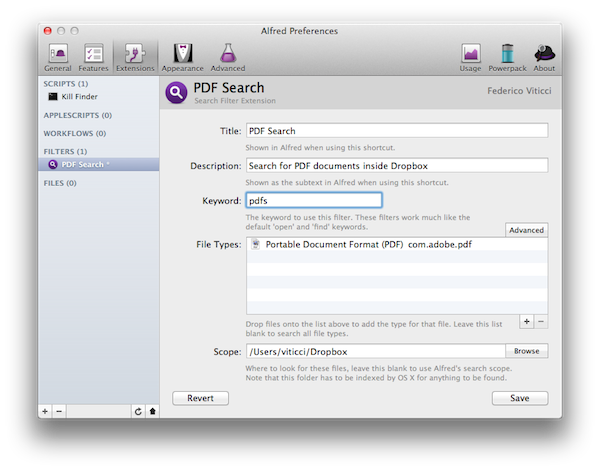 When I typed my "pdfs" keyword followed by the file name, however, Alfred only brought up the PDF document. The result was fast and accurate. If you combine this with Alfred's navigation capabilities and "date range" options in the Preferences, you get a powerful alternative to Apple's Search Tokens in Lion that you can customize at any time. The "file or group" functionality is the opposite of search filters in that it lets you assign specified files or folders to a keyword, and launch them all at the same time. From the Preferences, you can pick an app, a folder, a document -- whatever -- give it a keyword, and save. 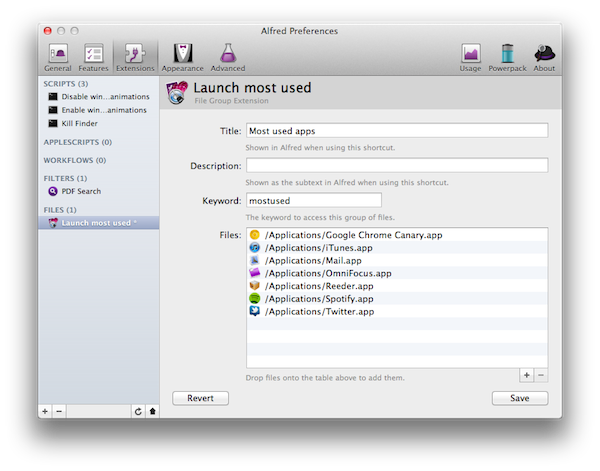 The next time you invoke that action, Alfred will open/launch the selected apps/files/folders. For example, I created a "most used apps" action, selected the 7 apps I use the most on my Mac, and gave it a simple keyword I can remember. Every time I log into my Mac, instead of manually opening every single one of those apps, I can type the shortcut, hit Enter, and have Alfred open all of them for me. Once again, the customization possibilities for this seem endless -- I'm thinking about opening multiple Finder windows with Alfred, and run an AppleScript to resize them on screen after that. Alfred 0.9.9 is a solid update that confirms this app isn't just about launching applications anymore. Alfred can now navigate folders, execute AppleScripts and shell scripts, do custom searches of any kind and much, much more. You can download Alfred for free from the Mac App Store or the developers' website, and purchase the Powerpack at £12 (around $18).